After recovering from the busy weekend I noticed on Monday that my weather station was acting like it needed new batteries. So I went out into the blustery breeze and disassembled the sensor that holds the batteries. At least I tried to. The cover that shields the temp/humidity sensor and transmitter was stuck. It is supposed to simply slide on and off. But it didn’t want to slide/move/budge. I sometimes give in to the philosophy of “don’t force it, get a bigger hammer”. In this case the “hammer” was a pair of pliers, but things went about as expected. I got the cover off, but I may have damaged the humidity sensor. That is, the indoor console is not receiving any data from the humidity sensor and the software on my laptop is not receiving ANY weather data from the console. When I look at the log file there are a lot of entries about data block blahblahblah having a bad sensor value and ignoring said data block. I have not figured this out yet. I may need to replace the temp/transmitter piece, or the two headed USB cable that connects the console to the computer. I have had other things to keep me occupied this week, so this one has kind of been put on the back burner. I will get to it when I can. The other things are of course goats. Skeeter had another abscess and it looked like it was about to burst. I did not want her in with the new babies, leaking highly contagious ooze, so I took her in to the Vet. on Wednesday. She lanced the abscess and reminded me that as long as the wound is draining she could spread the infection and I should probably isolate Skeeter until the wound healed. 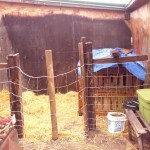 I have not had a place to isolate sick or injured goats, so I built one that afternoon. It is located between the goat shelter and the old bunk house. I had a ton of cleanup to do before I could begin building, and I still have quite a bit of cleanup to do. The fencing was almost the easiest part, the shelter is cobbled together from a couple of pallets and some old plywood. I originally had the shelter in the other corner of the space, but Skeeter would not use it. I think she just wanted to be close as possible to the other goats, but also the other corner still smells strongly of cat. 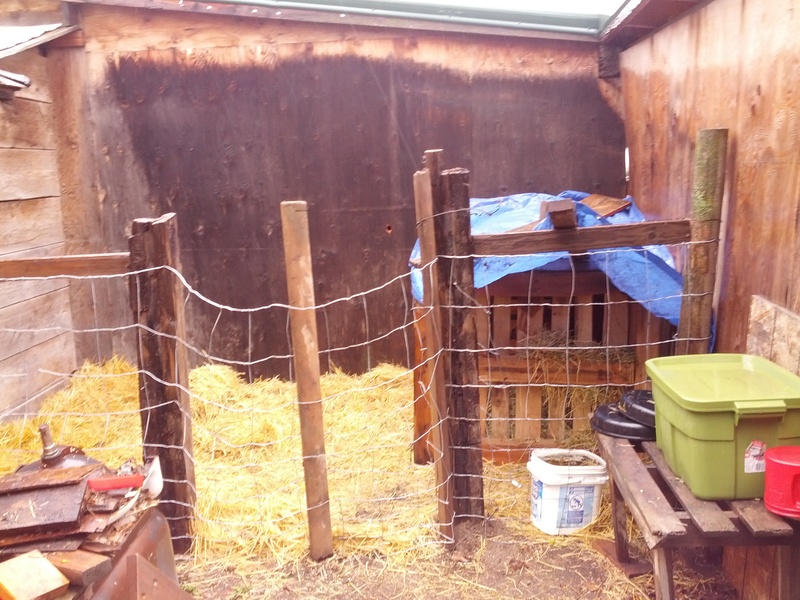 I added the tarp to keep the rain off since it has been raining almost from the first hour I put her in the pen. I will bring her back into the main shelter if her wound is healing well when I check her tomorrow. Last week I wrote that I had ordered some forage oat seed from Amazon. It arrived on Tuesday. I went back to trying to sprout the feed oats, filling one tray of that on Monday and one on Tuesday. Then I did two trays of seed oats, one on Wednesday and one on Thursday. So far this effort has yielded mediocre results at best. The feed oats do sprout, but don’t leaf out like I think they should. The germination rate appears to be less than 40%. I have tried soaking the grains for longer and shorter time periods and I have used small amounts of chlorine to kill mold. Nothing seems to make this work. I am hoping the seed oats do better. Today I bought a new shelf to use and I think it will improve the process. 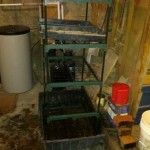 It is one of those 4 shelf mini greenhouses. BigLots had them on sale for $30. I put it together in a way that was not in the instructions and I am violating the warning that this is to be used OUTSIDE ONLY! 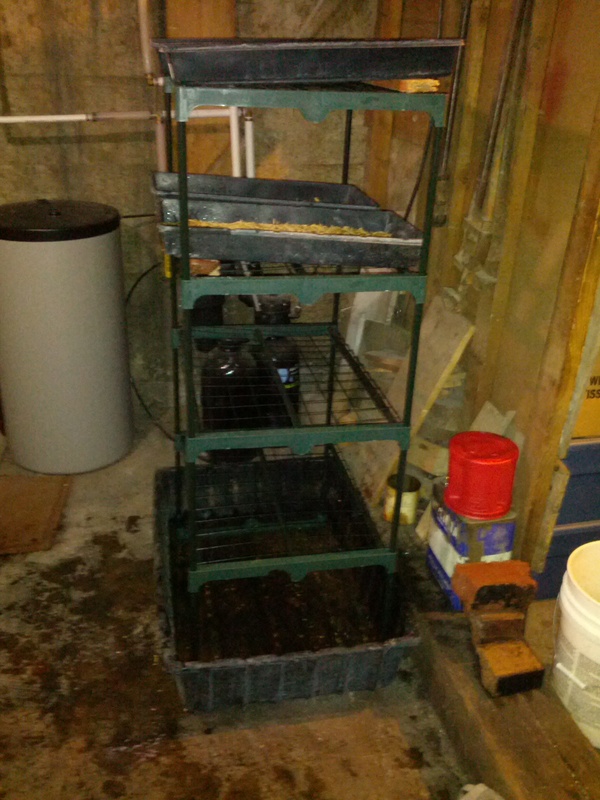 I can now sprout 8 trays of grains when I get this going. I just now came back in the house from my final nightly check of the critters. The new goat babies are a month old now. They have been eating grains and hay with their mamas and are getting too big to all fit under the milking stand. The ducks are getting bolder and today they attempted to cross the road to the wheat field. I have plans to fence in and expand the old chicken yard so they have a safe place to roam. I can’t have ~30 ducks free ranging the yard and garden. It would be hard to know if one was missing, and the mess would be incredible! Three ducks is just over the limit of messy that my wife will tolerate in the yard and around the house. I think this fencing project has priority over even the goat pasture expansion. The apple trees I planted last year, one is growing and budding out, the other one the cats killed by using it for a scratching post. I have no bees yet.